Enterprise Only: Mount filter feature is a part of Vault Enterprise Premium. Mount filters are a new way of controlling which secrets are moved across clusters and physical regions as a result of replication. With mount filters, users can select which secret engines will be replicated as part of a performance replication relationship. By default, all non-local secret engines and associated data are replicated as part of replication. The mount filter feature allows users to whitelist or blacklist which secret engines are replicated, thereby allowing users to further control the movement of secrets across their infrastructure. General Data Protection Regulation (GDPR) is designed to strengthen data protection and privacy for all individuals within the European Union. It requires that personally identifiable data not be physically transferred to locations outside the European Union unless the region or country has an equal rigor of data protection regulation as the EU. Failure to abide by GDPR will result in fines as high as 20 million EUR or 4% of the global annual revenue (whichever greater). 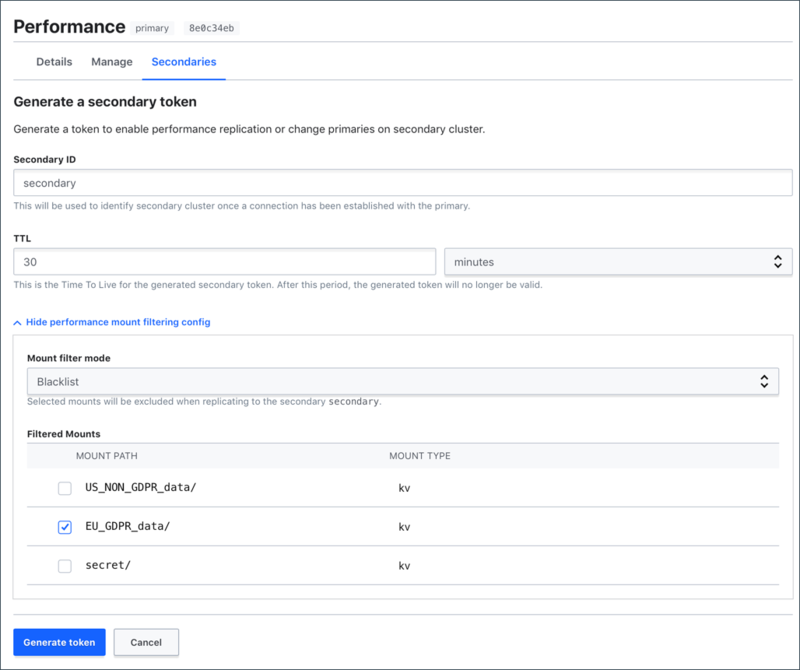 Leverage Vault's mount filter feature to abide by data movements and sovereignty regulations while ensuring performance access across geographically distributed regions. The Preparing for GDPR Compliance with HashiCorp Vault webinar discusses the GDPR compliance further in details. This intermediate Vault operations guide assumes that you have some working knowledge of Vault. You need two Vault Enterprise clusters: one representing the EU cluster, and another representing the US cluster both backed by Consul for storage. NOTE: Refer to the Vault High Availability with Consul guide for configuring your Vault server. 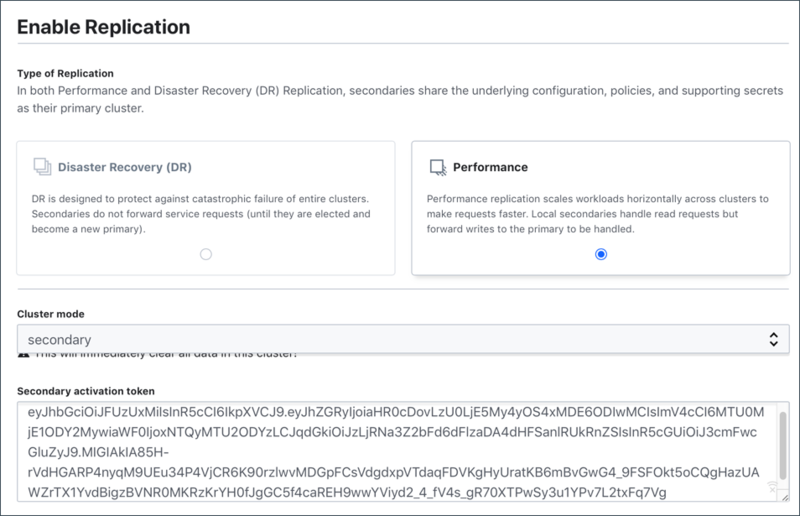 Scenario: You have a Vault cluster in EU and wish to span across the United States by setting up a secondary cluster and enable the performance replication. However, some data must remain in EU and should not be replicated to the US cluster. 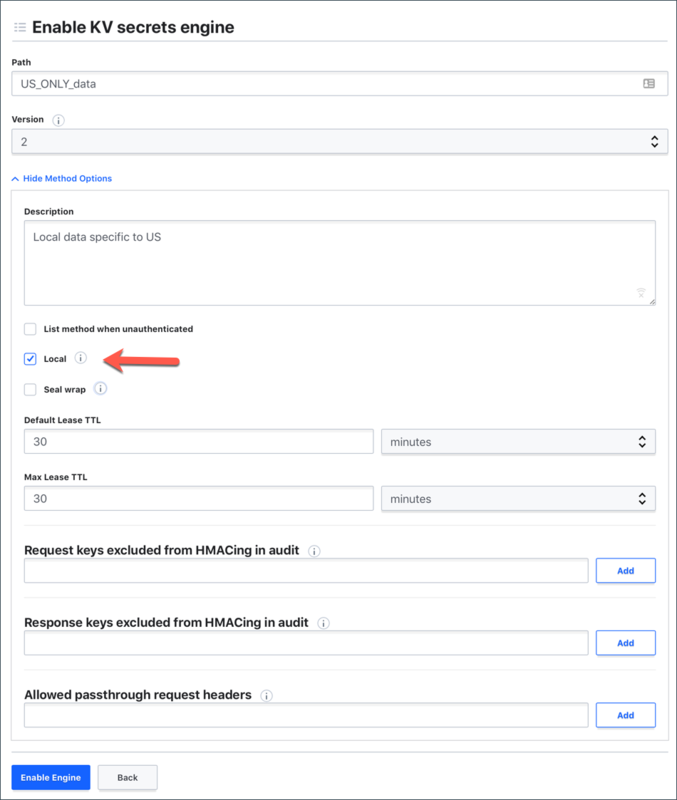 Leverage the mount filter feature to blacklist the secrets, that are subject to GDPR, from being replicated across the regions. NOTE: Ensure that GDPR data is segmented by secret mount and blacklist the movement of those secret mounts to non-GDPR territories. Open a web browser and launch the Vault UI (e.g. https://eu-west-1.compute.com:8200/ui) and then login. Select KV from the list and then click Next. Enter EU_GDPR_data in the Path, and then click Enable Engine. Select Secrets and Enable new engine again. Enter US_NON_GDPR_data in the Path, and then click Enable Engine. Click Enable Engine to complete. 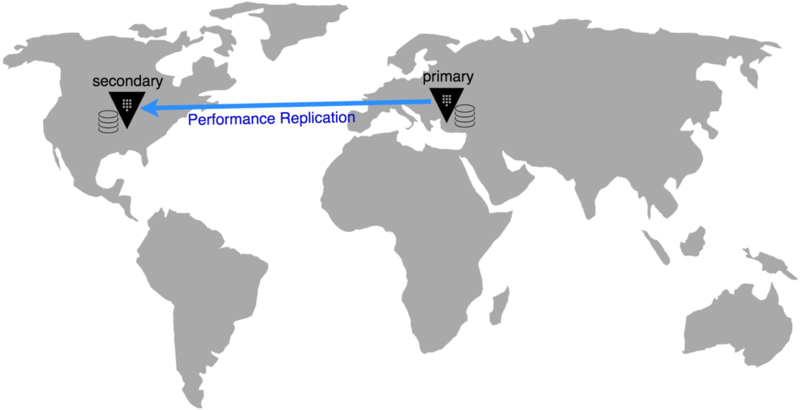 Enable performance replication on the primary cluster. unavailable for a brief period and will resume service shortly. NOTE: If the primary's cluster address is not directly accessible and must be accessed via an alternate path/address (e.g. through a TCP-based load balancer), use the primary_cluster_addr parameter to specify the address to be used by the secondaries. Otherwise, the secondaries use the configured cluster address to connect to the primary. See the Vault High Availability with Consul guide for an example Vault server configuration. $ vault write sys/replication/performance/primary/secondary-token id="secondary"
Create a mount filter to blacklist EU_GDPR_data. 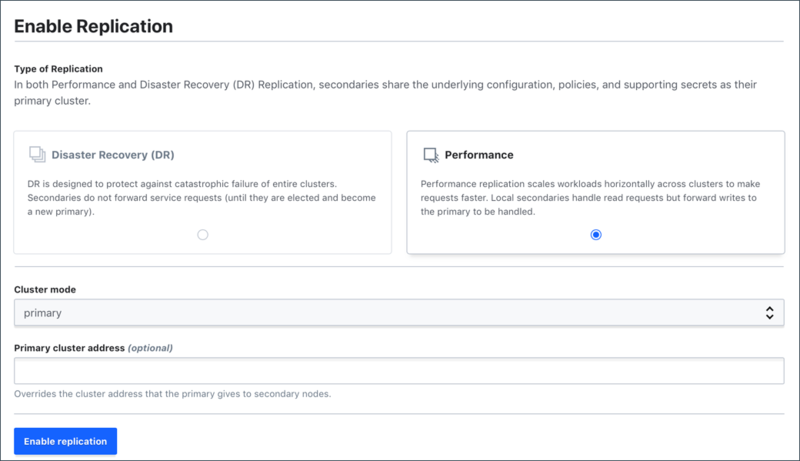 Enable performance replication on the secondary cluster. $ vault write sys/replication/performance/secondary/enable token="..."
Where the token is the wrapping_token obtained from the primary cluster. NOTE: This will immediately clear all data in the secondary cluster. "This cluster is being enabled as a primary for replication. Vault will be unavailable for a brief period and will resume service shortly." Where the token in payload.json is the token obtained from the primary cluster. Select the arrow next to Status and click Enable under REPLICATION. Select the Performance radio button. NOTE: You can leave the Primary cluster address (optional) filed empty if cluster_addr is specified in the Vault server configuration file. Set this value if the primary's cluster address is not directly accessible and must be accessed via an alternate path/address (e.g. through a TCP-based load balancer). Otherwise, the secondaries use the configured cluster address to connect to the primary. See the Vault High Availability with Consul guide for an example Vault server configuration. Select the Secondaries tab, and then click Add. Populate the Secondary ID field, and then select Configure performance mount filtering to set your mount filter options. You can filter by whitelisting or blacklisting. For this example, select Blacklist. Check EU_GDPR_data to prevent it from being replicated to the secondary cluster. Click Copy to copy the token. Now, launch the Vault UI for the secondary cluster (e.g. https://us-central.compute.com:8201/ui). Check the Performance radio button, and then select secondary under the Cluster mode. Paste the token you copied from the primary. Sign out of the secondary cluster UI. NOTE: From this point and on, the secondary cluster requires the primary cluster's unseal key to unseal. If the secondary is in an HA cluster, each standby node needs the primary cluster's unseal keys to unseal. The secondary cluster mirrors the configuration of its primary cluster's backends such as auth methods, secret engines, audit devices, etc. It uses the primary as the source of truth and passes token requests to the primary. 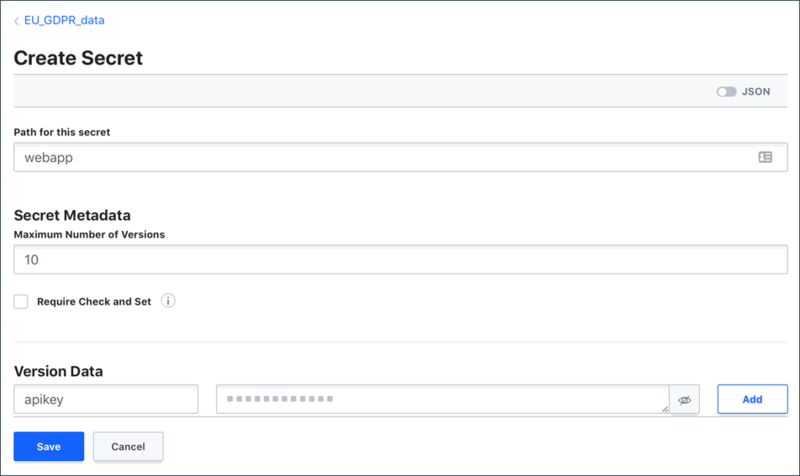 Enable and configure the userpass auth method on the primary cluster and create a new username and password. $ vault write auth/userpass/users/admin password="long-passw0rd" policy="admin"
Log into the secondary cluster using the enabled auth method. $ vault login -method=userpass username=admin password="long-passw0rd"
On the secondary cluster, generate a new root token using the primary cluster's unseal key. Log into the secondary cluster using the generated root token. Once the replication completes, verify that the secrets stored in the EU_GDPR_data never get replicated to the US cluster. $ vault kv put EU_GDPR_data/secret pswd="password"
$ vault kv put US_NON_GDPR_data/secret apikey="my-api-key"
"Invalid path for a versioned K/V secrets engine. See the API docs for the appropriate API endpoints to use. If using the Vault CLI, use 'vault kv get' for this operation." On the EU cluster, select EU_GDPR_data > Create secret. Enter some test data and click Save. Repeat the step to write some secrets at the US_NON_GDPR_data path as well. Return to the US cluster, select US_NON_GDPR_data. You should be able to see the apikey under US_NON_GDPR_data/secret. The EU_GDPR_data data is not replicated, so you won't be able to see the secrets. NOTE: Refer to the Monitoring Vault Replication guide for replication health check. When replication is enabled, you can mark the secrets engine local only. Local secret engines are not replicated or removed by replication. Login to the secondary cluster and enable key/value secret engine at US_ONLY_data to store secrets only valid for the US region. Be sure to select the check box for Local to keep it mounted locally within the cluster. NOTE: US_ONLY_data only exists locally in the secondary cluster that you won't be able to see it from the primary cluster.